place your sitting bones equally down on the floor. This keeps the lower back on both sides evenly long. Otherwise you may compress the shorter side when turning. Now, elongate and lift the sides of the trunk, turn the tummy, then chest and shoulders. This applies for both open and closed twists. Place the foot well into the groin keeping the inner heel long. 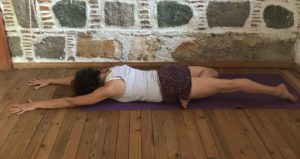 Lie down on the floor with inner heel still long and knee facing direction end of mat – just like in upright treepose when having the knee facing down. Personally I love this pose, it really stretches the inner groin and just feels good, provided you have no knee issues. This variation is safer for the knee. You place the foot into the other leg’s groin. Keeping the inner heel long you protect knee and inner meniscus. Move the tailbone in and stretch from the back lower ribs up thru the arms. This pose gives you a pleasant stretch in the groins as well.